The conventional method for dentists to assess gum health is to use an instrument called a periodontal probe — a thin, hook-like metal tool that's marked like a tiny measuring stick and inserted in between the teeth and gums to see whether and how much the gums have shrunk back from the teeth, creating pockets. This method of measuring pocket depth is the gold standard used in dentistry. A pocket depth measuring one to two millimeters indicates healthy gums while three millimeters and deeper is a sign of gum disease. The deeper the pockets, the more severe the gum disease. The method begins by rinsing the mouth with a paste made of commercially available food-grade squid ink mixed with water and cornstarch. The squid-ink-based rinse serves as a contrast agent for an imaging technique called photoacoustic ultrasound. This involves shining a light signal — usually a short laser pulse — onto a sample, which heats up and expands, generating an acoustic signal that researchers can analyze. "Light in, sound out," Jokerst said. Squid ink naturally contains melanin nanoparticles, which absorb light. During the oral rinse, the melanin nanoparticles get trapped in the pockets between the teeth and gums. When researchers shine a laser light onto the area, the squid ink heats up and quickly swells, creating pressure differences in the gum pockets that can be detected using ultrasound. 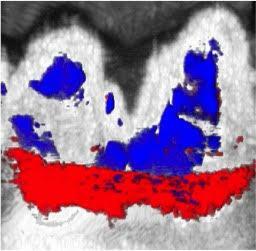 This method enables researchers to create a full map of the pocket depth around each tooth — a significant improvement over the conventional method. Moving forward, the team will be collaborating with dentists and testing their method in humans. Future work also includes minimizing the taste of the squid ink oral rinse — it's salty and somewhat bitter — and replacing laser lights with inexpensive, more portable light systems like LEDs. The team's ultimate goal is to create a mouthpiece that uses this technology to measure periodontal health.